La Bagnaia Golf & Spa Resort Siena, Curio Collection by Hilton boasts a selection of restaurants and bars that enrich the Tuscan experience. The traditional Osteria Antica Posta Filetta is located in an old horse riding station with a truly Tuscan atmosphere. The formal and elegant La Voliera Restaurant is dedicated to authentic Tuscan cuisine with a creative spin from the Chef. Bar La Voliera provides an extensive cocktail list to enjoy while dining on the terrace. There is also the Pool Bar & Grill, for sipping drinks and true Italian Aperitivo poolside. After a day on the golf course, guests can enjoy a quick bite or drink at the Royal Golf Clubhouse. Hours: Monday to Sunday, 7:30 p.m. - 10:30 p.m. The elegant and refined La Voliera Restaurant provides an exclusive atmosphere of the perfect setting to discover new flavors that exalt the quality and freshness of the ingredients. The restaurant offers all day dining, including breakfast. 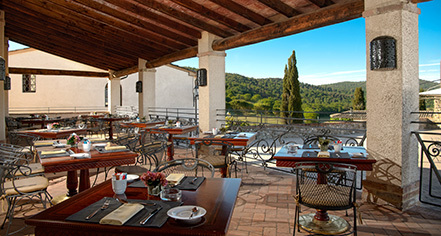 Dinner at La Voliera Restaurant is an unforgettable culinary experience, with an esteemed wine cellar to complement the meal, and a magical terrace to dine by candlelight with enchanting views over the gentle hills of Siena. Hours: Monday to Sunday, 7:30 p.m. - 11:00 p.m. Inside La Voliera Restaurant is the cocktail bar, with its extensive list of cocktails and a terrace with beautiful views. Hours: Monday to Sunday, 10:30 a.m. - 7:30 p.m.
Open during the summer months, the Pool Bar is the ideal location to enjoy the Tuscan countryside and beautiful views over the Siena hills. Beach chairs and umbrellas are provided around the pool for comfort and relaxation. The Pool Bar serves all-day cocktails, snacks, light lunches, coffees, and fresh drinks. 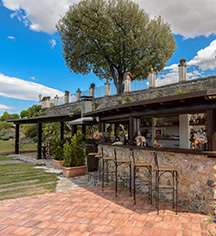 Hours: Monday to Sunday, 10:30 a.m. - 11:00 p.m.
Once a horse riding station, this osteria offers a truly original Tuscan experience, where diners can taste traditional dishes made with locally sourced ingredients, while relaxing and chatting with friends in an informal and warm atmosphere. Hours: Monday to Sunday, 11:00 a.m. - 6:00 p.m. The restaurant at the Royal Golf La Bagnaia can cater up to 80 people inside. Outside, it features a terrace for up to 100 people, offering light lunches al fresco.